When it comes to increasing your home’s privacy and security, our wood privacy fences can transform your property in ways you won’t believe. Wood privacy fences can be treated to last longer when exposed to the elements. Customers can choose from a variety of stains and paint colors to treat the wooden pickets. When the treated wood privacy fencing complements your home’s aesthetic, your home’s value is likely to increase too. We all know how crazy Texas weather can get — it snows one day, and the temperature rises to 90 degrees the next. These elements can cause the treated pickets to warp and cup, so while your wood privacy fence might have been straight upon installation, it won’t be long until you need to call a repairman to fix your fence. 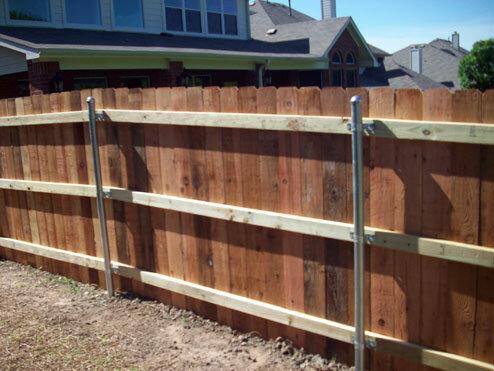 To prolong the life of your treated wood privacy fence, we offer treated 4 x 4 lumber posts and steel fence poles for durability and strength. If you’re ready to create your own private oasis with a wooden privacy fence in your backyard, contact Leander’s Apple Fence Company. We’ll answer any questions you may have and provide you with a free estimate.